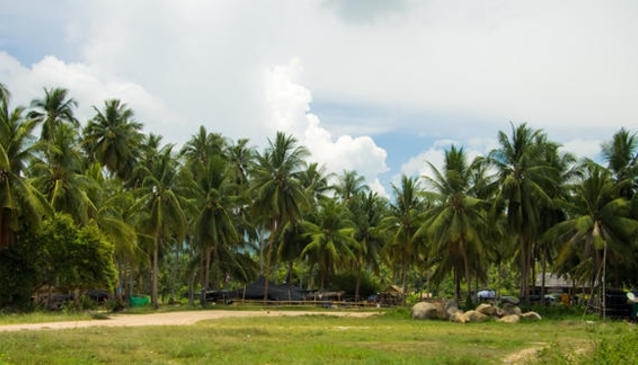 Taling Ngam is located on the south western coast of Koh Samui, the main road that runs through the area is the 4170. You can enter this road from the ring road coming from Nathon and also just outside the village of Hua Thanon. Once you turn off onto the 4170 you notice an immediate change in scenery and life. Speeding cement trucks, minivans and pick-ups are replaced by farmers with custom built sidecars, filled with produce heading for the market, mums and kids on scooters and elderly pedestrians. The road breaks off gently into the jungle, there's no saturation of convenience stores, or karaoke bars, mostly local 'ma & pa' stalls with local produce. Noodle shacks, soup stands and quaint local restaurants centered around small local family villages. The population here is not dense, instead you'll find wide plains of coconut plantations, and jungle forest covering the hill slopes rather than villas and resorts. The natural marshes and rivers are undisturbed here, water is plentiful, allowing the village community to be spread out, with many houses being isolated in the middle of large areas of land. Many traditional wooden Southern-style long-houses are on view, still standing with out-buildings for the whole extended family. The rivers and bays provide the seafood catch, while marshes provide mineral rich herbs and vegetables. The delicious sprouts and greens you find served with your hot soup. The life of the hunter gather is still a legacy that continues here, which probably accounts for the many elderly citizens in good health and vigorous demeanor. Family is everything in Taling Ngam and the elderly are treated with the utmost of respect and are always kept company by members of the family, never neglected. One of the finest beaches if not the best is Taling Ngam beach. It is quiet, without resorts, or many tourists, the water is calm and shallow, great for kids swimming. The horizon is broken by the Five Islands, a group of islands with an interesting story you should read further about. Finally the sunsets here are worth all the superlatives you can imagine, so many colors and shades of beauty across the water and clouds, as the sun drifts off beyond the horizon. A great time to visit.